Pros: Nice management options with plenty of customization. Two great play modes included within the game. Very huge amount of stuff which will keep you entirely busy. Cons: Very effective screen layout along with simple and attractive controls. Even non fans can enjoy as the game is a bit intimidating. 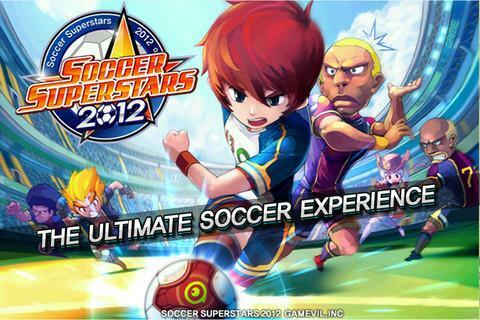 Soccer Superstar 2012 is a wonderful soccer game. We all are familiar with the great soccer game. As you are currently reading down this article I can also understand that not only you are familiar with soccer game, but also you are a great fan of it. This game includes running after the ball, kicking the ball and even there are options by which you can make the goalie a less useless one by spending money on him. Let's move down deep into this game to find out what other interesting features that Soccer Superstar includes to make you a complete fan of this game. The main advantage of this game is that, it is not much complicated process to line up your team on the ground and kick the ball. 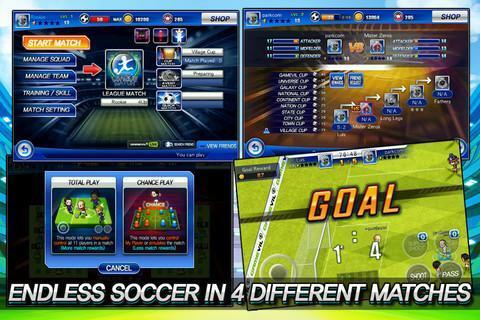 Mainly, the game Soccer Superstar 2012 delivers two different game modes: one “Total Play” and other one “Chance Play”, this feature in this game is really helpful that even novices can get their success with much less effort. In the first mode “Total Play”, which is made for experts, you are the one in charge for the whole play and you are one responsible for everything that happens in the game. The duration for the game will be few minutes and you have to play from start till the entire game finishes. You can always switch the players as you go in between the game according to the situations. In this game mode you will be the one who controls passing, kicking, switching the players, running, shooting and all other possible action that a team have to undergo during a real soccer match. Your responsibility also extends to both offensive and defensive modes of the game. It means that you will be the one who will be controlling even the goalie of your own team. You can give your big hands in the above interactions and if you are correctly done then you will be the one who can earn more points along with the victory and you will be finally in “Chance Mode”. In Chance Mode the entire game gets simulated. You can always create an avatar, which will be representing you throughout this game, and as your avatar gets a scoring chance the game pauses, dropping you on to the field and the controls with be switched for you to easily control your own personal player to make a move of your wish and score a goal. This feature in Soccer Superstar will give the user a complete feeling of a real player in a soccer field rather than forcing the player to play an entire match. Do you still in a confusing mind? Let me clear more features of Soccer Superstars 2012 accurately and you will be cleared after knowing the whole features of this amazing pretty soccer game. There are more interesting features delivered by this game which are still yet to be explained. You can always hire staff members like a doctor for your team, ticket management, sell field-side advertising, set players, set team strategies, treat injured players, draft players, upgrade player skills, release under performers and much more amazing features that the game is providing for you to enjoy. Soccer Superstar 2012 is a clear and colourful game, but still it carries some issues like data overload. Although it have a great visual effects, for a mobile screen it is just too much conventional. But has a very good display with all the effects over a tablet. According to me, there is nothing which we ourself can do about these issues. There are a lot more features which you have to deal yourself in this game. Although we have seen that controls are smooth and perfect, it is not that perfect which can give us extremely great performing experience. The controls provided in the game are as follows: There is a pair of multifunction sliders on the bottom of the touchscreen display which is for kicking, passing, tackling and more other controls on the movement of your player. Also there is another control as a virtual thumbstick over the bottom-left corner of the screen which triggers the same controls along with the multifunctional controls. These two controls together makes us a good feeling of playing this game with some more amount of confidence. This is a pretty game that will satisfy you completely even if you are not that crazy soccer fan. But as far as soccer fans are concerned they have to try a kick over this game and feel the amazing features in it. After all I can say is you could get a great time kicking and passing and using your skills, you could beat your opponents and feel your power. Read about the game Shoot the Zombirds and know the features of this game. Know the pros and cons of the game Shoot the Zombirds and go through the walkthrough of the game and read the tips to play this game. Read the review of the game and decide if the game is worth playing or not.